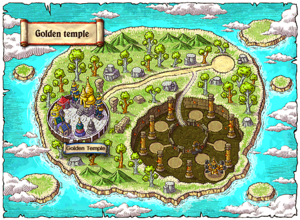 Golden Temple is a theme dungeon based off ThailandMS's (now defunct) Golden Temple. The monsters are the same, but stronger, and there are 2 new monsters as well. The story involves shaking underground in Golden Temple. 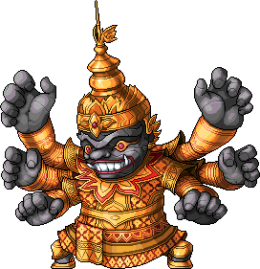 Noi the monk wants you to find two monks that went missing, leading to you defeating Goblins in the Goblin Temple and helping Somchai defeat Ravana. Meanwhile, Mr. Yoo the tour guide is trying to evacuate everyone, but one tourist is missing, and you must get her out of there! However, she doesn't want to leave just yet, since SnowFro stole her camera. Noi will contact you via lightbulb. Head to Golden Temple and talk to him again. You can access Golden Temple via the Crane in Mu Lung or the Dimensional Mirror. Talk to Somchai at Golden Temple: Forest of Training 2. Wild Monkeys are found at Golden Temple: Forest of Training 1. Retrieve GPS TourGuide from Mama Monkeys. Mama Monkeys are found at Golden Temple: Forest of Training 2. Retrieve Master Loong's Rosary from Teeny White Monkeys. Deliver it to Chan at Golden Temple: Forest of Training 4. Teeny White Monkeys are found at Golden Temple: Forest of Training 3. Kill 80 Teeny White Monkeys. Talk to Ritaya at Golden Temple: Forest of Training 4. Talk to Chan to enter SnowFro's Lair. Kill SnowFro the Fruitnificent and retrieve Ritaya's Camera. Kill 100 Mean Mama Monkeys. Talk to Master Loong at Golden Temple: Abandoned Temple. 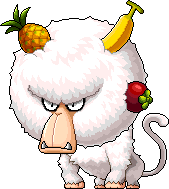 Mean Mama Monkeys are found at Golden Temple: Forest of Training 4. Blue Goblins are found at Golden Temple: Guardian Room 1 and Golden Temple: Guardian Room 2. Red Goblins are found at Golden Temple: Room of Trials 1 and Golden Temple: Room of Trials 2. Stone Goblins are found at Golden Temple: Ascetic Room 1. Kill 150 Strong Stone Goblins. Strong Stone Goblins are found at Golden Temple: Ascetic Room 2. Talk to the Gate of Trials at Golden Temple: Room of Suffering. Ganapatis are found at Golden Temple: Room of Suffering. Talk to the Gate of Trials. Retrieve a Sunburst from any of the Goblins, or Ganapatis. Return to the Gate of Trials. After this quest, you will be transported to Golden Temple: Entrance to Ravana's Altar to fight Busted Ravana. Enter the portal to Ravana's Golden Altar and kill Busted Ravana. Mastery Book 20 allows you to raise the master level of any skill to 20, at a 100% chance. Obtain a Sunburst by collecting 10 Burning Sunbursts from any of the Goblins, or Ganapatis. Double click the 10 Burning Sunbursts to make a Sunburst. After this quest, you will be transported to Golden Temple: Entrance to Ravana's Altar to fight the real Ravana, unless you haven't defeated Busted Ravana yet. This page has been accessed 51,478 times.